It’s 7:28 a.m., Sunday morning, as I write this post, and I’m glancing out my patio door, watching the sun rise over the tops of the trees. I’m sipping my first cup of coffee shivering at the thought of the temperature outside. My mind drifts. I think of my mother, and how she used to rouse me from the bed with the sound of the piano and something beautiful she played like Fur Elise and Moonlight Sonata. I can almost hear the songs now and I’m smiling so big I want to call her, but she lives in a different time zone and I don’t want to wake her so early. My mother is the great Influencer in my life. She’s the one who introduced me to books and the entire series of Little House on the Prairie, by Laura Ingalls Wilder. I couldn’t read until I was almost eight years old. I had a mild learning disability and a lazy eye that didn’t catch up until right about that age, and also right about that age, I came down with the worst case of the flu I could ever imagine. I slept in the basement, on my grandma’s old green pull-out couch. My mother was right there next to me, tucking me in, making me drink fluids, and of course, reading to me every moment I lay awake. She has a lovely voice, and I remember her opening Little House in the Big Woods and filling my pain-filled head with beautiful images that took away some of the misery. I went to Amazon.com this morning and I searched for the book. I reread the first couple of pages in the preview section and sighed out-loud. It captured me again. First of all, the book starts with my favorite fairy tale opener: Once Upon a Time … my fingers and toes already begin to curl up with excitement. Next, the writing in the book builds up the imagination. 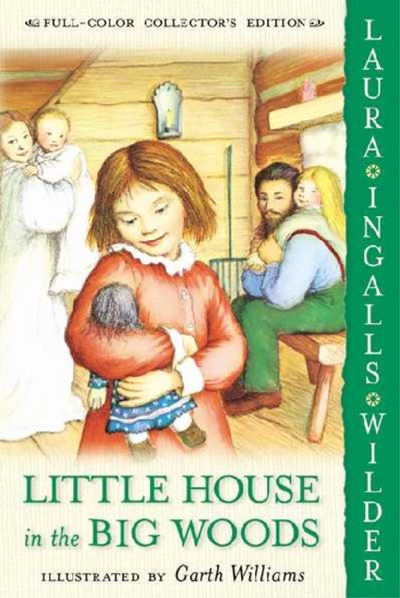 Right from the get go, Laura Ingalls Wilder builds the scene in the simplest and cleanest way to where you are immediately pulled into the woods in Wisconsin. You see the trees, the bears, the wildlife she encountered as a young child. You meet Laura and you learn her language and the reasons why it was used. Ms. Wilder talks to the reader like she’s sitting there next to you explaining the relevance of the past with the present. I love this storytelling technique. Last thought. Her stories are full of adventure, life and realism. There’s an edge of excitement. There’s a definite picture she creates. I can see it. I can feel it. I want that my for kids, too. How about you? What was your all time favorite childhood book? Posted on October 21, 2013, in Uncategorized. Bookmark the permalink. 4 Comments. I loved this series. : ) As far as favorites that my mom read to me, the top of that list might be "A Little Princess" by Francis Hodgson Burnett. Sara Crewe handled herself so well, in good times and bad! Hi Danielle. I don't think I have read that book but will definitely look it up for my little girl. :o) Thank you for sharing your favorite with me.